So, last weekend, while the hubby was away auditioning for the Utah Shakespeare Festival and one Young Man was off to spend the night prior to a day of LARPing and the other furiously writing for his critique group, I decided to try some wines I hadn’t tried yet. Three days, three bottles. What could possibly go wrong? My Take: I was perfectly prepared to love this wine, so imagine my surprise when, serving it with garlic chicken, it left me…wanting. I didn’t taste the bright cherry or the spice…I tasted minerals. Heavy minerals that left a heavy taste in my mouth. Maybe it was the high alcohol content? 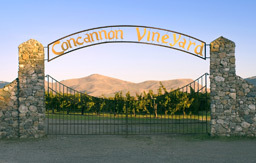 Concannon Central Coast Pinot Noir Established 1883 in the Livermore Valley Alcohol 13.5% by volume $9.99 at Vons. My Take: Prior to starting dinner, I didn’t really want to open this bottle so I had a small glass of the Cline Zinfandel. And as soon as I was done with that, I opened the Concannon with a sigh of relief. Again, a reading dinner, this time with a fall veggie mix and whole-wheat pasta with fresh parmesan on top and – of course – garlic bread, made the Sicilian way. Which is…toast a baguette sliced in half until well toasted, then rub a large clove of garlic into the toasted side. The garlic kind of melts into the bread. Top it off with a sprinkling of olive oil (and pepper if you desire, which I do! ), and you’ve got a feast fit for a king, even if you’re just serving the garlic bread and the wine. And the wine? Mmmmm. My Rating: ~ Very Drinkable ~ But of these three, the Jargon is my hands-down favorite. So, I survived my weekend alone. And on Monday, the hubby very kindly finished up all my open bottles – even the Cline. After all, he’d been in Mormon Country for the past three days. As usual, this is just my honest opinion and depend upon my mood, the weather, and whether there’s a full moon or not. Your taste buds will differ. Demon Soul is available for the Kindle and the Nook, not to mention in paperback!! Get your copy today! This entry was posted in Wine Friday and tagged auditions, Central Coast, Chicken, Christine Ashworth, Cline Cellars, Concannon Vineyards, demon soul, Garlic, Jargon Wines, Los Angeles Romance Authors, Mormon Country, Pasta, Pinot Noir, Reading Dinners, Sicilian Garlic Bread, Utah Shakespeare Festival, Young Men, Zinfandel. Bookmark the permalink. Christine, that bread sounds delish. I’m at my daughter’s place. Better not stink it up with garlic, unless she’s agreeable. A mom knows her place. : ) Love the sound of the Jargon, and it’s even a good name for a wine drinking writer. Christine, that garlic bread sounds delicious and easy. Last time when we visited the US most of your winemakers still used corks. Down here in New Zealand and in Australia too, we have the screwtops. They’re so much easier and the waste due to corkage is nil. Are screwtops becoming more common now? Shelley, unfortunately, most wineries still use cork. I think it such a waste. 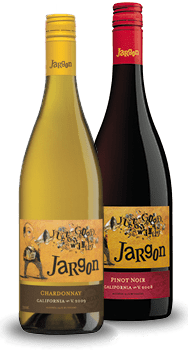 I go out of my way to look for wines with screw tops – and this weekend so far I’ve found two wineries that use screw tops. (I’m in Paso Robles!) So we’re still behind you Aussies and Kiwis in the whole screw tops.